THERE are over half a million blogs on the Internet featuring the name ‘Lionel Messi’ and with his dazzling performances over the last few years, it comes as no surprise. Ballon d’Or winner for the past two years, and nominated for a third-time this year, at the age of just 24, will Lionel Messi become the best player the game has ever seen? Barcelona snapped up an 11-year-old Messi, when he was diagnosed as having a growth hormone deficiency, the Spanish giants offered to pay for the $900-a-month treatment, if he signed for the club. And ever since making his debut as a baby-faced 16-year-old for the Catalan team in 2003, he has burst onto the scene. Messi has already won more than George Best ever did and more European Cups than Diego Maradona, so maybe he needs to match Pele’s World Cup winner medal’s to be known as the best ever. Perhaps, Messi being tipped to be the greatest ever player is helped by the fact he is playing in what is becoming to be known as the greatest ever team. Although, Messi scooped up last year’s Ballon d’Or, in second and third place respectively were Barcelona team-mates Andres Iniesta and Xavi Hernandez. This year, the 2011 Ballon d’Or shortlist reads: Messi, Xavi and Cristiano Ronaldo. Messi is tirelessly judged against La Liga rival Ronaldo. The often inevitable comparisons often lead to the conclusion that Ronaldo is more of an athlete than Messi – being stronger, bigger, faster. Messi stands at just 5 foot 7 while Ronaldo is 6 foot 1, but what is the obsession with physical stature? Last season, Messi scored twice as many Champions League goals than Ronaldo with half as many shots and the Argentine has more assists alone this year than Ronaldo has amounted in the past two seasons. But with Messi scoring 97 goals in his last 102 games and Ronaldo notching 75 goals in his last 83 appearances, there is no denying that the pair are on fire. Both players celebrated victory last season, with Messi’s side clinching the Primera Division and Champions League, while Ronaldo’s Real won the Copa del Rey, defeating Barca 1-0 in extra-time. Real Madrid star Ronaldo insists he is not jealous of Messi and stressed that he doesn’t “have an obsession” with the Barcelona maestro. Despite missing out on recent individual awards, Ronaldo says he holds no ill-feeling towards Messi and insists that he is solely focused on his own target of winning silverware with Real this season. “I don’t have an obsession or a direct rivalry with Messi,” he said. “I feel the same way about other players. But, one thing is certain: I want to be the best of all footballers. 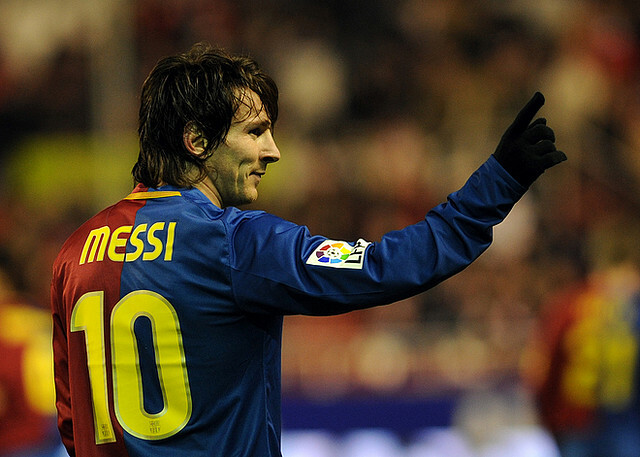 The heir to Maradona’s throne, the Spanish press has called Messi, “Messidona”, a tag he has certainly lived up to. Maradona’s most famous goal came against England at the 1986 World Cup, known as ‘Goal of the Century’ and was almost replicated by Messi on April 18th 2007. In a cup match against Getafe, Messi ran about the same distance (62metres), beat the same number of players (six including the goalkeeper), scored from a similar position and ran towards the corner flag just as Maradona did 21 years earlier. Outside football, Messi has continued to demonstrate his world-beating abilities. In 2007, Messi established the ‘Leo Messi Foundation’, to educate and provide free health care to under-privileged children. He was also made a goodwill ambassador for UNICEF in March of last year. While former Barca president Joan Laporta has described Messi as the best player in the club’s history – this claim doesn’t seem too ridiculous. The greatest player of 2011? Or the greatest player ever? Posted in Sport and tagged Football, Messi. Bookmark the permalink.